Death is a grisly business. It comes to all of us. Even if you happen to be the King of France who's been reining the kingdom for 72 years. From all the documented evidence indicates Louis XIV died of gangrene on his leg caused by diabetes. The year was 1715, without modern medicine, he died a painful, horrible death surrounded by physicians who were perplexed by his conditions. Catalan filmmaker Albert Serra has been tackling literary/historical figures in his films -- Don Quixote in Honor of the Knights, The story of Magi in Birdsong, Casanova and Dracula in The Story of My Death; approaching them in minimalist, aggressively formalist fashion. Armed with extensive court medical documents and writings of Duke Saint-Simon and the French New Wave icon Jean-Pierre Léaud as the king, Serra sets out to make a straightforward account of the last days of Louis XIV. Except for the first few minutes of the film where we see the king on the carriage outside, coming back from a hunting trip, the entire film takes place in the stuffy ornate interior bedroom of the Versailles. Gangrene has set in on the king's left leg and physicians are rubbing it with herbs, hoping it will go away. The old king mumbles and shouts in pain while eating grapes and sweets administered by the same physicians who argue endlessly among themselves what to do about the situation. People try to entertain and laugh at everything his Highness says, priests are called in to give the last lights but then sent back because he feels better, and so on. Even the learned physicians of the Sorbonne have no idea about the king's illness. His leg starts to stink and turns completely black. Everyone's waiting on the inevitable. There are some funny bits with a snake oil salesman played by great Catalan poet and art critic Vicenç Altaió (whose turn as Casanova in The Story of My Death was hilarious) with his 'cure all' tonic made out of bull's sperm and other animal parts. After the initial success of the king's improving health after taking the tonic, the condition worsens and they order the phony physician's arrest. Léaud, 72, has been keeping his restless, adventurous New Wave spirit alive by working with many daring contemporary filmmakers (Tsai Ming-liang, Bertrand Bonello, Olivier Assayas just to name a few) over the years. Here, he accepts the physically confounding role and fully collaborating with Serra, whose filmmaking charts new territories in cinema. 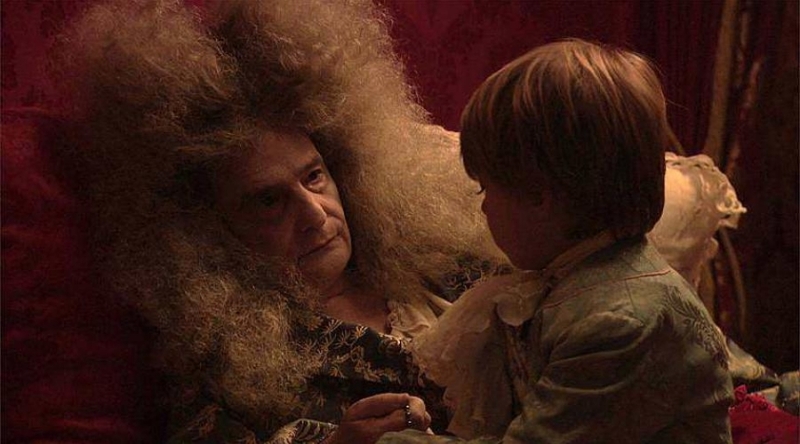 Perhaps the most poignant moment of the film is forever bedridden Louis XIV receiving his 5-year old great-grandson (the future Louis XV) and giving him advice. Having seen countless war and suffering of people in his time, he recommends the young kid to relieve his people’s suffering and avoid war as far as possible. Even though Louis XIV’s health deteriorated quite rapidly in a month, the film feels like an eternity. But Serra never waivers in his aesthetics and keeps a straight face until the end. The irony of the king's death is heightened by its straightforward presentation and procedural approach. The Death of Louis XIV is a very singular formalist filmmaking in its highest order. The Death of Louis XIV is acquired by Cinema Guild for Spring 2017 release. please check their website for more details.